Football And CTE: In New Study, Nearly All Donated NFL Player Brains Found To Have CTE As the country starts to get back into its most popular professional team sport, this serves as a reminder of how dangerous football can be. 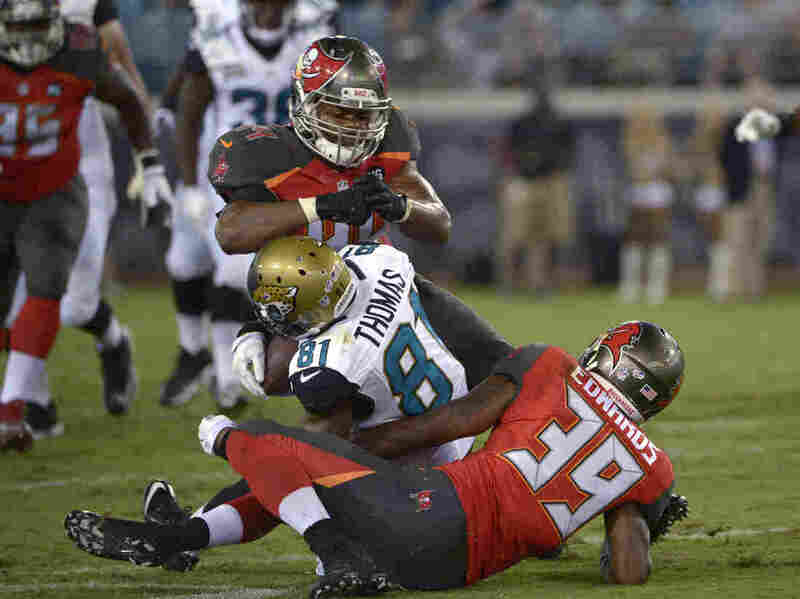 Jacksonville Jaguars wide receiver Lamaar Thomas (center) is hit in the head by Tampa Bay Buccaneers linebacker Brandon Magee as cornerback Kip Edwards helps make the tackle a 2014 preseason game. Magee was penalized for the hit. The study examined the brains of deceased former football players (CTE can only be diagnosed after death) and found that 110 out of 111 brains of those who played in the NFL had CTE. CTE has been linked to repeated blows to the head — the 2015 movie Concussion chronicled the discovery of CTE's connection to football. In the study, researchers examined the brains of 202 deceased former football players at all levels. Nearly 88 percent of all the brains, 177, had CTE. Three of 14 who had played only in high school had CTE, 48 of 53 college players, 9 of 14 semiprofessional players, and 7 of 8 Canadian Football League players. CTE was not found in the brains of two who played football before high school. According to the study's senior author, Dr. Ann McKee, "this is by far the largest [study] of individuals who developed CTE that has ever been described. And it only includes individuals who are exposed to head trauma by participation in football." The fact that we were able to gather this many cases [in that time frame] says this disease is much more common than we previously realized. A CTE study several years ago by McKee and her colleagues included football players and athletes from other collision sports such as hockey, soccer and rugby. It also examined the brains of military veterans who had suffered head injuries. The study released Tuesday is the continuation of a study that began eight years ago. In 2015, McKee and fellow researchers at the Department of Veterans Affairs and Boston University published study results revealing 87 of 91 former NFL players had CTE. McKee is chief of neuropathology at VA Boston Healthcare System and director of the CTE Center at the BU School of Medicine. Speaking about the new numbers, she says it's "startling to be able to gather 177 examples of CTE" in a relatively short period of time (the past eight years). "While we still don't know what the incidence is in the general population or in the general population of football players," she says, "the fact that we were able to gather this many cases [in that time frame] says this disease is much more common than we previously realized." McKee cautions, however, that researchers cannot extrapolate from the numbers and come to conclusions about CTE. All the brains studied were donated, she says. "Families don't donate brains of their loved ones unless they're concerned about the person. So all the players in this study, on some level, were symptomatic. That leaves you with a very skewed population." Still, McKee is adamant about one point. "We're seeing this [CTE] in a very large number that participated in football for many years. So while we don't know the exact risk and we don't know the exact number, we know this is a problem in football." Longtime concussion expert Dr. Munro Cullum says the study is helpful for several reasons. "It obviously adds to the cases in the literature," he says. "It has expanded the age range [of those with CTE] beyond just retired NFL players. And [researchers] did find increasing CTE pathology in the cases [of players] who were older. That's all useful information." But Cullum, a neuropsychologist with the O'Donnell Brain Institute at University of Texas Southwestern Medical Center who has studied concussions at all levels of sport for nearly three decades, says it's still too soon to definitively declare CTE a problem in football. "It seems to be, perhaps, more common in people who play football," he says, "but we don't know why. We actually don't know what the causative factors are or the risk factors [for CTE]. There still are probably yet to be discovered genetic and environmental factors that could be contributing as well." Cullum notes all the attention is on football right now. "It depends on where you're shining the light," he says. "We have to be very careful. If all I study is condition x or y, and I find that in the sample that I'm sent, what about the 99 percent of all the other samples?" Cullum and McKee agree on one thing: There has to be additional studies and more money for research. "We need a very well-constructed longitudinal study," says McKee, "looking at young individuals playing these sports. We need to follow them for decades. We need to take measurements throughout their lives and playing careers so we can begin to detect when things start to go wrong. If we can detect early changes, that's when we could really make a difference." McKee says researchers need tens of millions of dollars, even $100 million, to conduct the necessary research. "We need a lot of funding," she says, noting that the researchers are working with a grant from the National Institute of Neurological Disorders and Stroke that ends in December. "It's always tricky for us to get funding." She has submitted applications for funding into next year, she says, but she is not sure they will be granted. "There's so much discussion of this disease not existing that funding agencies are reluctant to consider this a real neuro-degenerative disease. "But I think we've proven beyond a doubt this is." And the attention should extend beyond football, McKee adds. "I think any sports organization that has participants that are exposed to head trauma needs to endorse this research and support it." The organization on the CTE hot seat, the NFL, says it has done so. "We appreciate the work done by Dr. McKee and her colleagues for the value it adds in the ongoing quest for a better understanding of CTE. Case studies such as those compiled in this updated paper are important to further advancing the science and progress related to head trauma. The medical and scientific communities will benefit from this publication and the NFL will continue to work with a wide range of experts to improve the health of current and former NFL athletes. As noted by the authors, there are still many unanswered questions relating to the cause, incidence and prevalence of long-term effects of head trauma such as CTE. The NFL is committed to supporting scientific research into CTE and advancing progress in the prevention and treatment of head injuries." The statement continues, "In 2016, the NFL pledged $100 million in support for independent medical research and engineering advancements in neuroscience related topics. This is in addition to the $100 million that the NFL and its partners are already spending on medical and neuroscience research." But McKee is skeptical of the NFL's promises to fund research. "I will be extremely surprised if any of the 100 or 200 million comes my way," she said in response to the league's statement. "The NFL directs funding only to research they approve of." The NFL has funded a portion of her past research, but in McKee's view, there will be "no continued NFL support" because "the results are considered too damaging." Despite the NFL's statement supporting McKee, the league wasn't always a willing partner of CTE research. Many accused the NFL of denying, or even covering up, the link between football-related head injury and brain disease. As part of a massive concussion lawsuit settlement with thousands of former NFL players, reached in 2013, the league didn't have to acknowledge any wrongdoing. But the NFL has responded to the concussion issue, instituting new policies and enforcing existing rules to better protect players. The moves to protect football players are important, says Cullum, despite the uncertainties still surrounding CTE and concussions. "Obviously any brain injury is not good," he says. "But right now, we don't know how many concussions are too many or for whom." McKee anticipates her study will become part of the ongoing discussion about football's future and whether young people should play the game. "I'm worried about these numbers steering the conversation in that these numbers are of a very biased brain donation research," she says. "But the fact that we found [CTE in 177 players] is cause for concern." "While I'm not willing to say football is doomed and I also am unwilling to make a decision [on a young person playing football] for other individuals ... I think there's a risk to playing football," she adds. McKee says she does suspect the "longer and higher" the level a player goes, the more likely it is that player gets CTE, but reiterates that more research is needed "to really come up with the answers."